Hi everyone! This weekend, we’re discounting a collection of science fiction themed games and videos, as part of our Sci-Fi Deals Flash Sale. 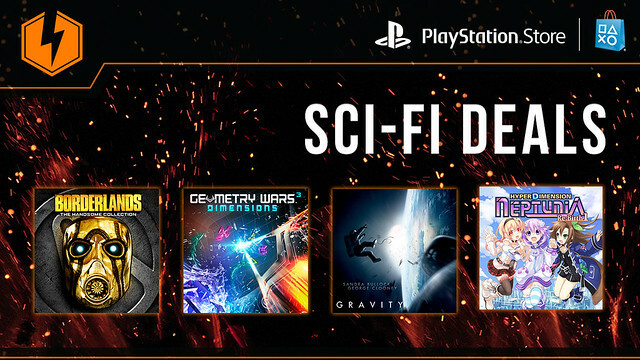 Head over to PlayStation Store through the weekend for up to 80 percent off titles like Borderlands: The Handsome Collection, Geometry Wars 3: Dimensions Evolved and Hyperdimension Neptunia ReBirth1, as well as films like Gravity, District 9 and many more. But kick it into hyperdrive, because our Sci-Fi Deals Flash Sale ends Monday, July 20 at 9:00 a.m. Pacific. Note: All pricing is for U.S. only and subject to change without notice. Rentals for around $13? Must be a misprint. Also, I’d be more willing to buy movies if I they worked with Ultraviolet. Time to link up these accounts. Just download the Vudu app on your PS3 or 4. Vudu links with UltraViolet now, they’re pretty much one in the same anymore. I agree. I don’t like being locked to specific players. And the prices are a no go too. Nom Nom Galaxy for $6 is a steal. This game fell under the radar. Give it a shot, it’s probably the best Pixeljunk game so far. When are the two pieces of DLC for Alien Isolation going to go on sale? Talking about Last Survivor and Crew Expendable. Been a few sales for the game and season pass but those never get discounted. Should of mentioned that the sale was to celebrate New Horizon’s Pluto flyby. Considering it has a Playstation CPU. Got Geometry Wars 3 for PS4. Good enough for me. What the… The Pre-sequel is $60 here! That’s insane. The vita offerings stink. No earth defense force? And put ZHP unlosing ranger on sale already! Lol. I hope they don’t change Borderlands price like they did with Dark Souls 2: Scholar of the First Sin. I remember that sale, Sony? I remember. It still hurts. Nope, the discount is here to stay! And I hope its not a LIE like the Shadows of Mordor one. I feel you bro, we will never forget. Really, Chieh Chen? I have right here a screenshot proving that you changed Borderlands The Pre-Sequel price on this post. It was $8.25 before. I wanted so bad but I see what . This is not right. You should accept the consequences of your act. You put a price and that price should be. Also, Beyond Good and Evil is not on sale. Like I said, false advertising. Changing prices and games not on sale even telling us it is. Again, I have the screenshot to prove. Awesome. The prices are actually listed! For The Flash sales Yes. Not for the weekly sales though. And here we go again with Sony changing the prices. This and Borderlands: The Pre-Sequel have different sale prices in Canada. Borderlands Handsome Collection is US$30.00, but is CA$35.00 in Canada. Borderlands The Pre-Sequel is US$19.80, but is CA$23.10 in Canada. All other games on sale have the same price numbers in USA and Canada. Are you in Canada? Remember the current exchange is about $0.80 USD to $1.00 $CAD. At that exchange rate $30 USD is about $37 $CAD. There is usually some small print somewhere that states pricing may be different in Canada. thebiglouie beat me to it! “The Swapper” is an AMAZING puzzle indie, and a steal for $3! What About the PS plus extra discount? Flash Sales never have PS+ discounts. They’re for everyone. @Thillhouse They used to, but not lately. Thillhouse is correct. No PS+ discount here but still awesome prices for everyone! Any word of Resident Evil Revelations 2 for the Vita? Still dying to play that game. Nothing for me, Aliens is kind of tempting but there are other games I’d like to buy first like Infamous SS. Was hoping for that to be on sale in this. Far Cry 3 Blood Dragon isn’t on discount on the Store. Also, I agree with Splodem, you should have put Earth Defense Force on the sale too. Beyond Good & Evil HD isn’t on discount either. I’d like to get Blood Dragon also. Still not fixed. Maybe this isn’t going on sale since the other incorrect price posts have comments saying it was fixed, but not this one. Why is Alien Breed, a cross-buy game, $2.50 on the Vita but only $2.00 on the PS3? Shouldn’t they be they same price? I’m guessing this is just another mistake that should be corrected. Buy it on PS3 and you get the Vita version for free via Cross Buy. Resonance of Fate is worth it, in my opinion. I paid close to $30 for it on 360, and didn’t regret it a bit. Flashback was okay. I don’t really get the hate, if it is hated on. But I never played the original game, either. Can’t comment on Another World, as I haven’t played it. 1) RoF: It’s kinda original. 2) Another World: It’s really faithful to its source material. That’s all the “good” I have to say about those 3. I’ve been waiting for a hyperdimension neptunia rebirth 2 sale, Thanks! I might get Another World and Frozen Synapse too. Great sale! I KNEW it! You guys changed the prices again! This is false advertising. Goddammit. I even took a screenshot but I know they don’t care. Being fooled again. Can’t believe it. I was going to buy a ps4 but I’m seriously thinking about a xone right now. Geez. Yet another Flash Sale, yet another set of games I either own or don’t want. Oh well. Want to play Jamestown+ on the Vita. Hopefully it gets a port at some point. Grabbed Soldner X-2 and Another World for Vita this round. Dang Sony. You were just a couple days late on that Borderlands sale. OH MAN! finally, i was looking for Lumines! That’s a pretty low price for Revengeance ultimate edition. That’s because it’s a pretty low quality game. Rofl. Platinum made it in a year and acknowledged the linear level shortcomings. Everything else about the game, especially the gameplay, is top-notch. There is no other game with the fast paced ninja cyborg slashing/ cutting and parrying mechanic. One of the bet action games of all-time, don’t listen to the haters who probably sucked at it and are still whining it wasn’t a true MGS sequel when it was known it’s a Raiden spin-off from the beginning. It was Full Price a couple of months only. Since then it’s one of those “please, just take it!” titles that’s ALWAYS on sale. They even gave away the DLC FOR FREE. I get it. You love the game. That’s cool. But don’t be blind: the game was a big flop…and there’s a very good reason for it. Didn’t the Vita version just come out two weeks ago? No way that was happening. Ya I probably would have picked it up but I don’t mind waiting for it. Hey I see Beyond Good and Evil HD listed here as a sale, but over on the actual PS Store it’s still $9.99. Would definitely love to pick this title up on sale, hopefully this is an error that can be fixed before it ends. Who knows? Sony already changed values of some other games on this sale (they specially changed borderlands price, increasing it). Good luck. Decent sale, although it would be nice if the store didn’t keep crashing and the online store didn’t run so poorly on my tablet. Being pretty doesn’t make it work better. Seriously great sale! So many good stuff but I have a huge backlog although I was waiting to get Hyperdimension Rebirth 2 so this works out perfectly!! I still have to play through Rebirth 1 but now when I do I can hop straight into the 2nd one! 99 cent flash sales with Cubixx HD, Journey, and Flower please. I dont see it on playstation store on my ps4 ?? im from europe is it only for us / can? Unfortunately this sale is not available in Europe. Sorry about that! Should i get the Mass Effect series since its on sale right now? I would wait honestly. I picked up all three of them a month or two ago for $6 total. But entirely up to you. As AncLEoniX & Fuhr31 said: just WAIT for them. They’ll be cheap as dirt in no time (probably some other Flash Sale? =P). so will there come a sale like this in europe also this or next weekend ? Thinking on Resonance of Fate very deeply. Great sale! Got Starwhal to mess around a bit. Gonna see what else I buy. Thanks, Playstation! I bought Borderlands (the first one) for the PS3 in one of the last sales and fell in love with it instantly. I finished the game, got all the trophies, and wanted to have a look at the DLC so I was pretty excited about seeing the Ultimate Bundle on sale which comes with all the add-ons! But when I go to the store it says it’s “not available for purchase”, because I already bought the base game? What gives? I’m only interested in the add-ons but the Extravasplosion bundle with all the add-ons (without the base game) is still $19,99 – whereas the add-ons bundled with the base game is only $6! I just want to play the add-ons but I’m being punished for already buying the base game.. The Ultimate Edition has been on sale forever…and always practically for free. So you should’ve waited for it a little while longer. Why aren’t we seeing Borderlands for the Vita going on sale. I mean the game has been out for some time now, its about time we see it go on sale. So unless we would see it on PS+, which would be awesome but I highly doubt, we want it on sale! Apart from my complains about not seeing Borderlands, the sale is pretty descent. Finally picked up Luminies…..and that’s all. The other games for the vita, or should I say most of them, have already been free for PS+ or on sale. But thanks for Luminies. Loved it on my PSP back in the days. One more thing. Which studio developed patapon? I want to disturb them for a sequel for the Vita. Who’s with me? Probably because the game didn’t sell very well after all the complaining to get it ported. So the only way they can ever come close to recovering all the money they spent on porting it is to hope that people who want it eventually give up waiting for a sale and buy it. Of course, the poor sales probably had something to do with them announcing it would have a new trophy list, then when people like me ran out and bought it, we let people know that they lied. They just updated the PS3 list to include the Vita version. So trophy hunters instantly lost all desire to own it. I want bomber man world. And ps2 marvel nemesis or the psp version. I nabbed Resonance of Fate after trying to find the physical copy forever now and failing. A lot of them are not good. Seen star wars battlefront for 99 cent then that . Hyperdevotion Noire: Goddess Black Heart is a steal for 16 bucks. Got Borderlands Handsome Collection. There’s anything else worth for PS4? And if you’re an old school gamer…and don’t mind a very short game…you could buy Another World.